Did you know that12 percent of couples consider getting a divorce or separation mid-remodel? Don’t worry, I’m not hinting at anything. I’m just letting you know that renovations are hard, y’all. There were numerous times that I said “I’m done” and went home. Thankfully, home is only like 10 feet from the renovation project. Of course, I always came back, always continued working. I don’t live in HGTV land unfortunately. No Property Brothers were coming to save the day and finish the kitchen backsplash. 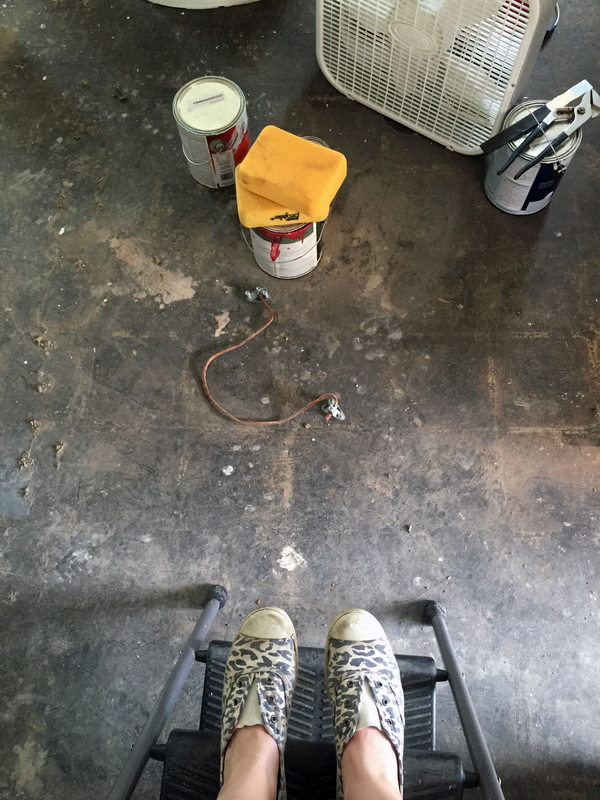 For the last few weeks of the renovation, we would come home and start working. There would be about a 30 minute break for dinner, and then it was back to work until about 10 or 11pm. Our cats forgot what our faces looked like. We were behind on our Netflix queue. It was a nightmare. I usually question people who post grainy, dark “before” photos. Of course the place looks better after the renovation! The “after” photos are 10 times better. You could have at least used a flash to take these awful “after” photos. Ugh. Renos are ugly & dirty. Now I know not to judge. Just another lesson in humility, one of many learned through this renovation. All of my “before” photos are really… pathetic. I’m sorry, I must have taken these photos with my eyes closed. Or, I was so disgusted by the state of the apartment that I took the photos and escaped as quickly as I possibly could. The biggest change occurred in the bathroom. We got rid of the light green, and utilized the dark plum that is in our dining room. 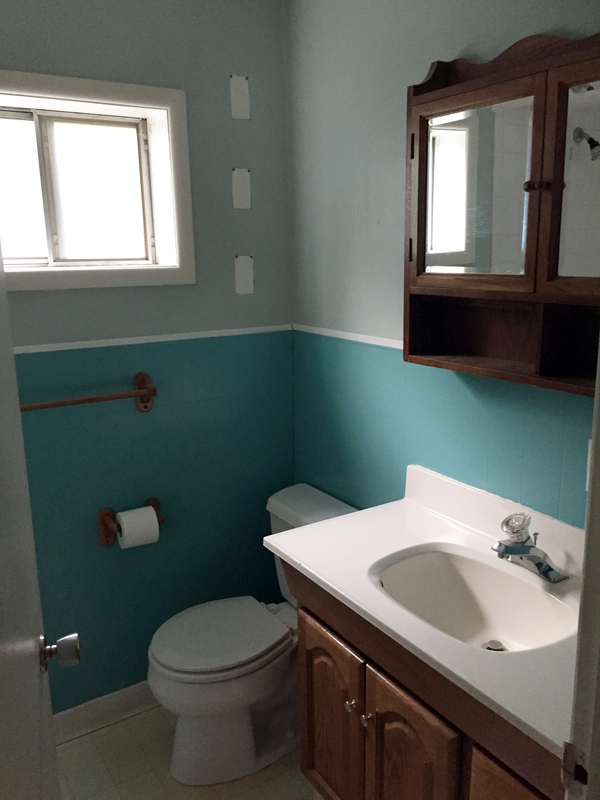 It took two coats of primer and two coats of bright white to cover the teal on the lower half. I refinished the oak cabinet in a deep black, and updated the hardware from brass to a brushed oil-rubbed bronze. 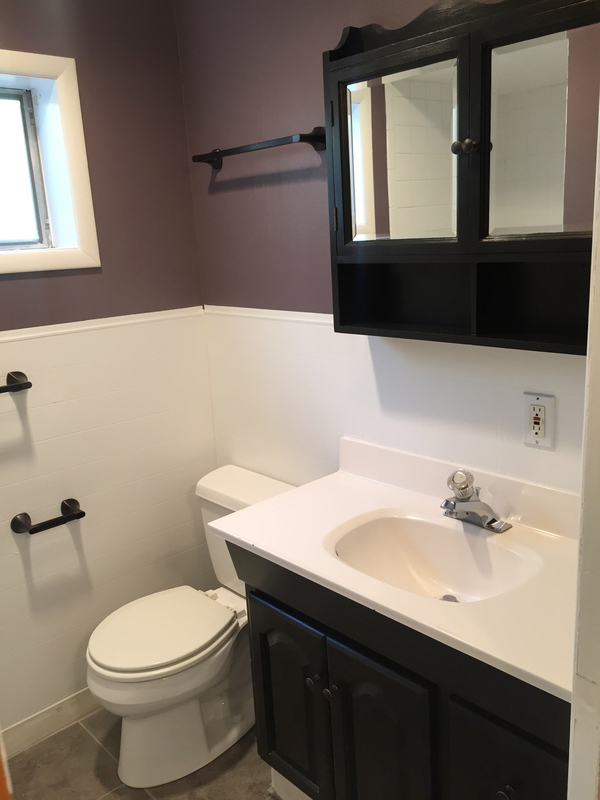 We even switched out the wooden toilet paper and towel holder with brushed oil-rubbed bronze (who likes a wood toilet paper holder? Gross). What you can’t see is the hot water heater. We had that moved to the attic, and had a washer/dryer unit installed. To do the installation, they had to cut into the concrete foundation, which meant we had to pull up the laminate flooring. 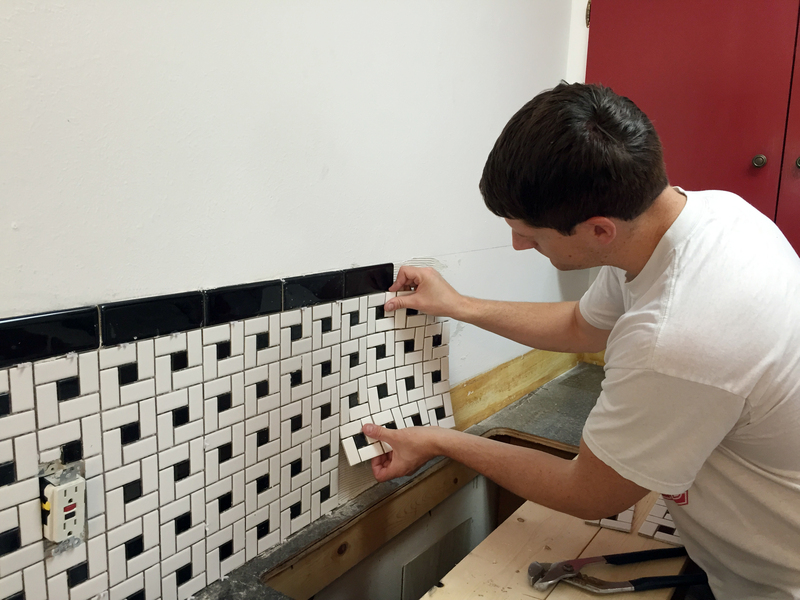 We went ahead and had new tile flooring installed that matches the new flooring in the kitchen/dining room. My new favorite room in the apartment. The bedrooms got new paint, with the master getting a new window. We also installed new carpet throughout the apartment– the original carpet was dull, stained white. The master got a new light fixture, but I, of course, didn’t take a photo of the original one. Let’s just say it was a glorious combination of 1960s, flowers, and brass. Sorry, but yellow is my least favorite color. I decided to use a light, coastal blue for the bedrooms. 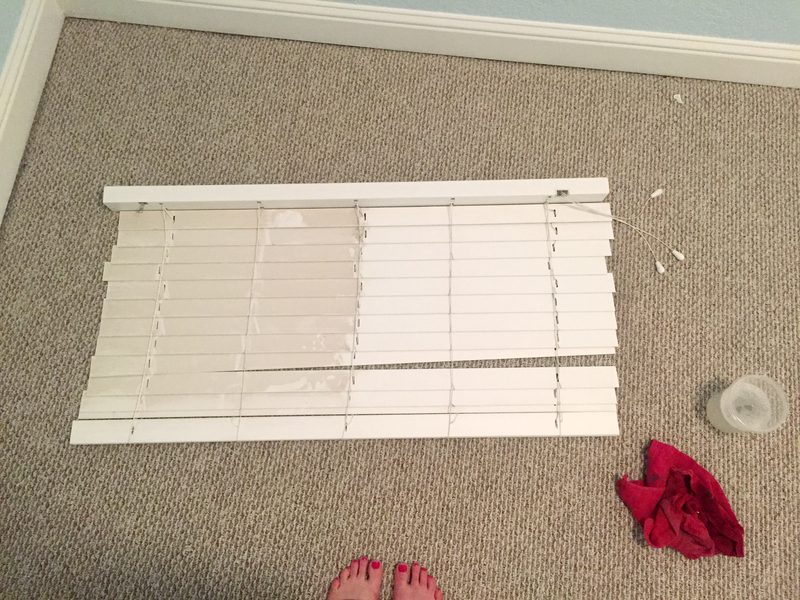 Let this be a lesson to you: clean your blinds. I spent about an hour cleaning the blinds in both the bedrooms. In the kitchen, we decided to stick with the original red cabinet doors and the vintage feel. 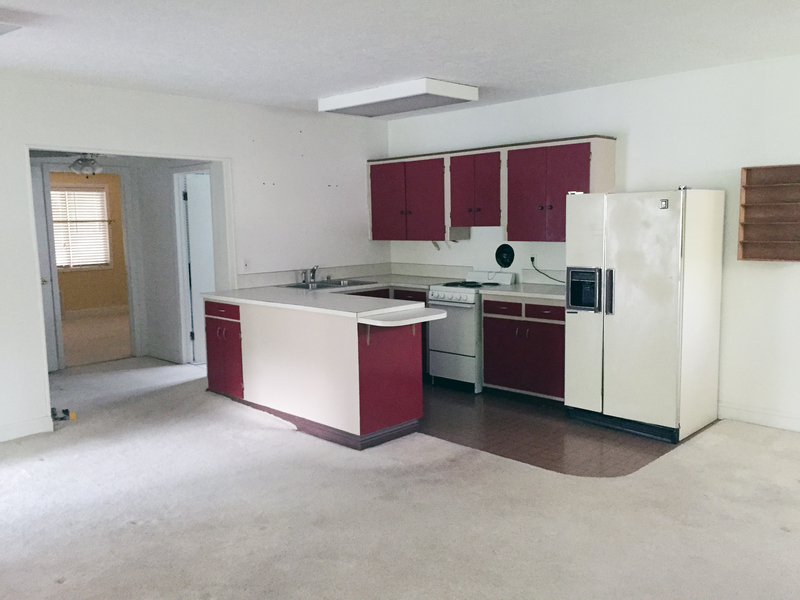 We’re pretty sure the kitchen is original from the 1960s, when they converted the detached garage into the apartment. 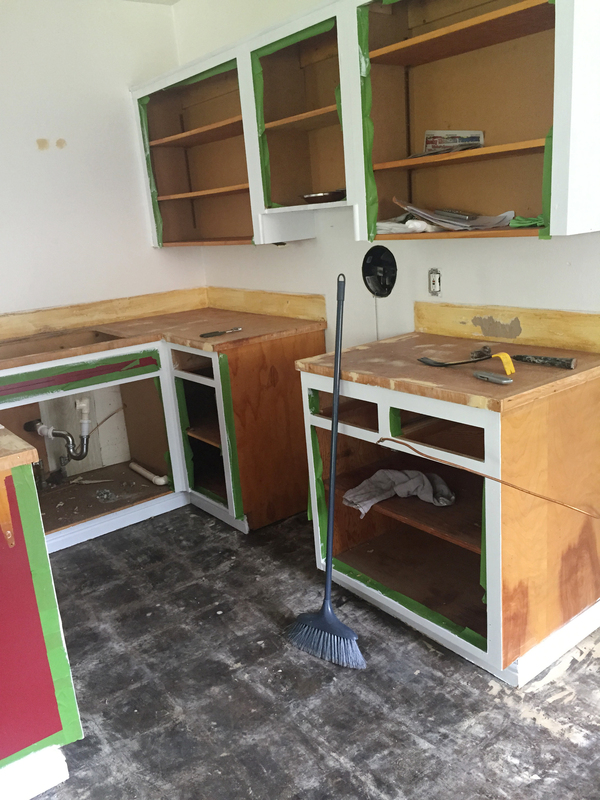 We did paint the rest of the cabinets white because they were a dirty beige color. We also switched out the pulls on some of the cabinets. I took a hammer and a crowbar to the white laminate countertops one Friday night and pulled them all off. The kitchen without the countertops or flooring. We then had a handyman attach new black laminate countertops. Here’s something else I learned: trust your gut. I really didn’t like the handyman who came out for the job, and my instincts proved correct. 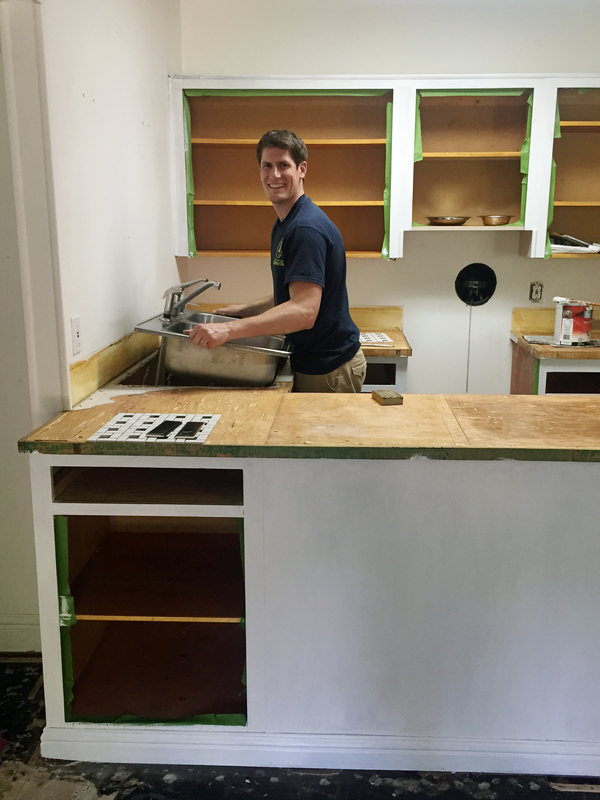 He did a rather shabby job on the countertop, and I actually had to have him come back out to fix the issues. Here’s my handsome husband removing the sink. You may notice a hole above the spot where the stove sits. Apparently, this was some kind of ventilation system/fan that blows the cooking smells and oils outside. The fan didn’t work, so Brad pulled it out and patched the wall inside and out. He then installed a vent hood to the cabinet above the stove– it looks so much better and works! On HGTV, they make installing a backsplash look like something you can do between commercial breaks during “House Hunters.” Not quite. We were lucky to have a good friend come over to show us how to start. I’ve learned that Brad and I can tend to overthink projects if given the chance. We spent about an hour hemming and hawing and measuring and measuring again, until our friend intervened. Once he got us started, we were on a roll. Until we ran out of tile and Lowe’s was already closed. Even though it took a while, I’m very proud of the finished backsplash. We had new windows installed in the living room and dining room, and bought new blinds, as the original ones were so stained (clean your blinds!). I pulled so many plastic anchors out of the wall. I’m guessing the previous owners had a love for either large mirrors or heavy crucifixes. 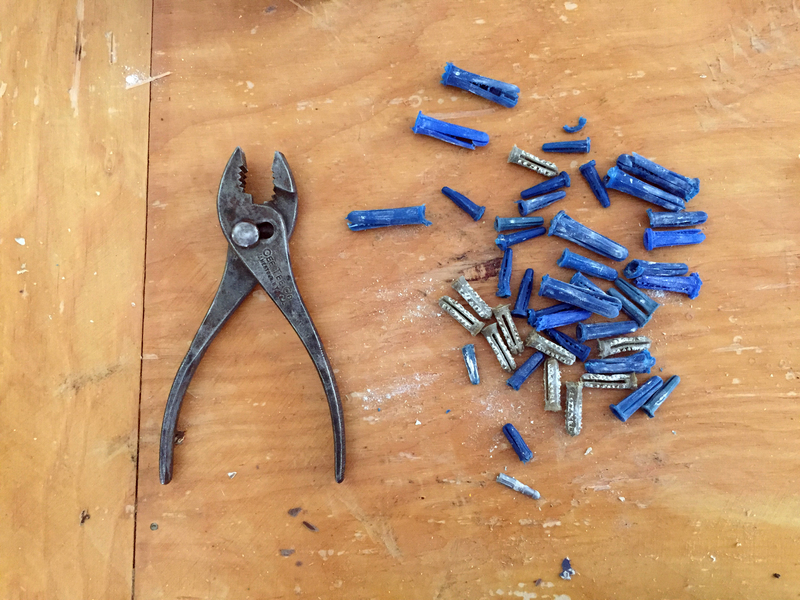 I pulled 75 plastic anchors out of the walls, and patched every single one. NOTE: If you ever find yourself trying to pull an anchor out of a wall, use a drill to screw a screw in to the anchor, then pull on the screw with a pair of pliers. It should pop right out. If it’s the large metal anchors, then it’s best to knock the anchor into the drywall and not try to pull it out. 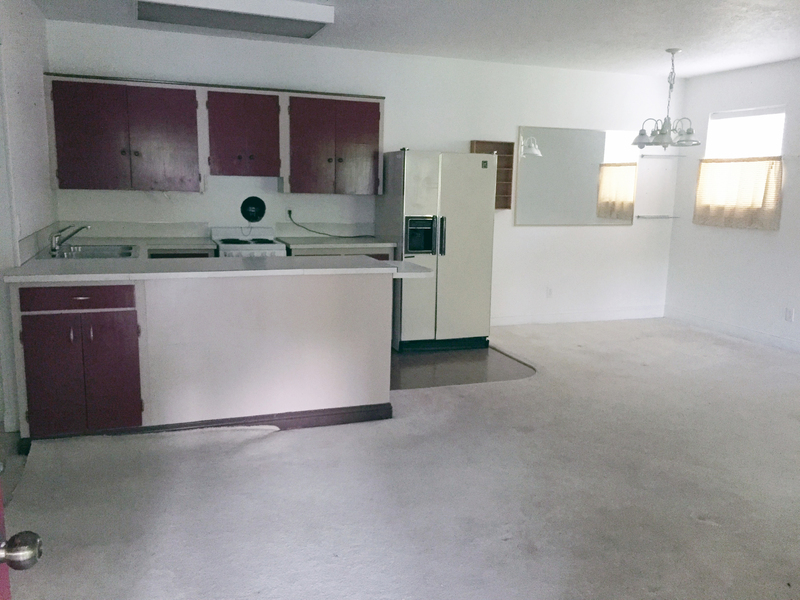 We painted the entire living space with a fresh coat of white paint. I also painted the spice rack white to blend in with the wall. The dining room chandelier was replaced by Brad with another oil-rubbed bronze fixture (are you seeing a trend yet? ), because we determined that some renters might want to use the space for something else besides a dining room. You can see that we had the tile extended into the dining room. No one wants to worry about dumping dinner on the carpet. The original dining room space. The new dining room space. Oh, you may notice a spaceship attached to the wall. That’s actually an AC/heat unit that we had installed. In a few years, we’ll take the apartment back over for ourselves and use it as a space for the kids and guests. We decided that a renter would probably appreciate air conditioning, so we decided to go ahead and have it installed. The AC/heater is a heat pump system, and the heat can’t keep up if the temperature drops really low, so we left the baseboard heaters to provide additional heat if needed. Are you really tired of reading this post yet? Because I’m pretty tired of writing it. To sum it all up: we have a renter now! He is Rick Grimes. Ok, maybe not. But he is a cop, and I’ve heard/seen that they’re handy to have around come the zombie apocalypse. But he also has said something about taking over our garden space and making it grow other things than weeds. I’m much more comfortable with a hammer than a spade, so this makes me very happy. And we’re leaving soon for a much deserved vacation Down Under. I love the retro look of the kitchen! Everything turned out great! I’m an HGTV junkie, but since I’ve been a serial renter for most of my life, I’ve never had the chance to undertake big projects. Kudos to you and your husband and enjoy your vacation! Thanks Samantha! I was glad to finally put everything I’ve learned from HGTV to the test. You’ll have your chance one day!